The man was killed when the Old Dominion Floor Company in Chesterfield collapsed. Another man was killed in a flash flood as the remnants of Hurricane Florence moved through the state. At least one weaker tornado also touched down in the state, according to preliminary information from the NWS. One person died in a building collapse near Richmond, Virginia, after a tornado touched down in the area, and another man was killed in a flash flood as the remnants of Hurricane Florence moved through the state. The National Weather Service (NWS) said Tuesday that tornadoes spawned by the remnants of Florence touched down in Virginia on Monday. One of those was responsible for the death of a man just outside Richmond. The NWS in Wakefield, Virginia, said the tornado was categorized as an EF2, with winds of up to 120 miles per hour, according to preliminary information. An EF2 is classified as a strong tornado on the Enhanced Fujita (EF) scale, which starts at EF0 (weak) and goes to EF5 (violent). The scale measures damage left by a tornado to estimate tornado wind speeds. The man who died after the tornado touchdown was killed when the Old Dominion Floor Company in Chesterfield collapsed, said emergency management coordinator Sherri Lafoon. Another person suffered minor injuries and was taken to a hospital. Everyone else in the building was accounted for. A second man died in a flash flood. First responders found the victim's pickup truck upside down and submerged in water that had flooded Route 607 in Louisa early Tuesday morning, Virginia State Police spokeswoman Sgt. Keeli Hill said. The area was drenched by thunderstorms and torrential rain overnight. Hill said it appeared that 59-year-old Richard Edward Kelih Jr. of Louisa was attempting to cross the road when his vehicle was overtaken by rushing water. The victim who died in the building collapse was an employee at the flooring company there, Chesterfield Fire/EMS spokesman Lt. Jason Elmore told a news conference. Elmore said when fire crews arrived, the store's manager told them that all of the store's employees were accounted for, except for one man. "We were able to get close enough to be able to see the deceased individual to realize that they were already deceased and that we didn't have to go in and to try to do anything," Elmore said. He said the victim was found dead under a pile of debris. A second person was taken to the hospital with minor injuries. The flooring company was nearly leveled. The roof blew off and debris was sent hundreds of yards across parking lots in the small industrial park where the business is located. All that could be seen hours later was the front of the building and multiple stacks of flooring. There were at least four dump trucks and other construction vehicles lined up at the curb across the street from the flooring company that were moved a few yards from their parking places. Some hoods were blown open, and the engines on some of those vehicles appeared to be damaged. 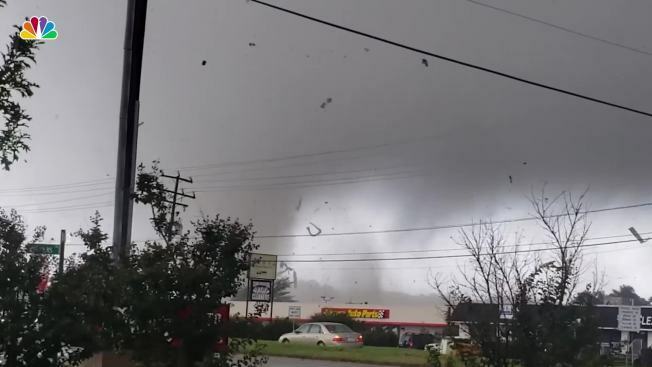 Virginia State Police said there were no other reported injuries in Richmond, but they were tracking reports that multiple tornadoes touched down in the area. Fallen trees and building damage were also reported. Pamela Wilson, 49, said she and her 12-year-old daughter, Jasmine, went into the bathroom of their home to take cover when they first heard alerts about the storm. "We heard a bang, so we got in the tub," Pamela Wilson said. The mother and daughter stayed in the bathroom for another 10 minutes and went out when the noise stopped. Pamela Wilson said that when she looked out her back window, she saw two trees lying across her lawn, and her side fence had been totally blown away. She saw sections of her fence on her neighbor's porch but couldn't find the rest of it. When she looked out the front windows, she said she saw that two large oak trees had fallen across the yard and her front porch right up to the front door, blocking it. She said several neighbors came over immediately to check on her family, and others came over with chain saws so she and her family could get out the front door. Jasmine Wilson boiled down the situation. "It was scary," she said. "I'm glad it's over." Dominion Energy reported 2,400 customers were still without power as of 1 p.m. Tuesday. 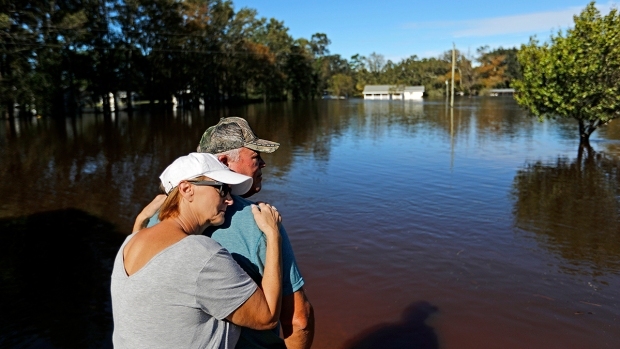 Virginia Department of Emergency Management spokesman Jeff Caldwell said his agency considers the storms part of the remains of Florence, which left flooding rains across much of North Carolina and parts of South Carolina over the weekend. Caldwell said Monday night the department was tracking at least seven potential tornadoes in the Richmond area.